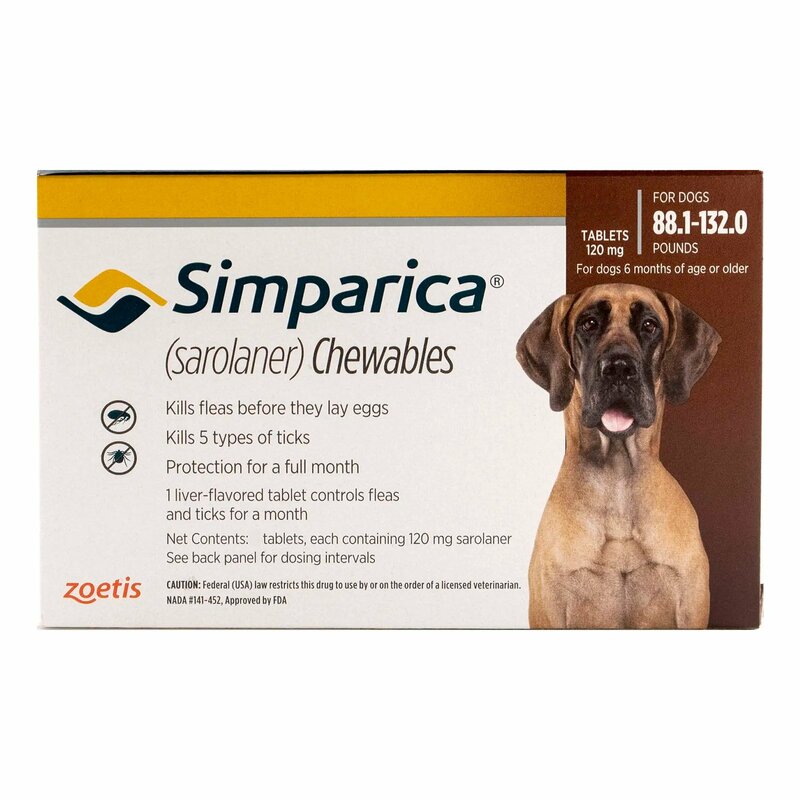 Simparica, a Zoetis product is a tasty liver flavored chewable tablet that is highly palatable in taste. 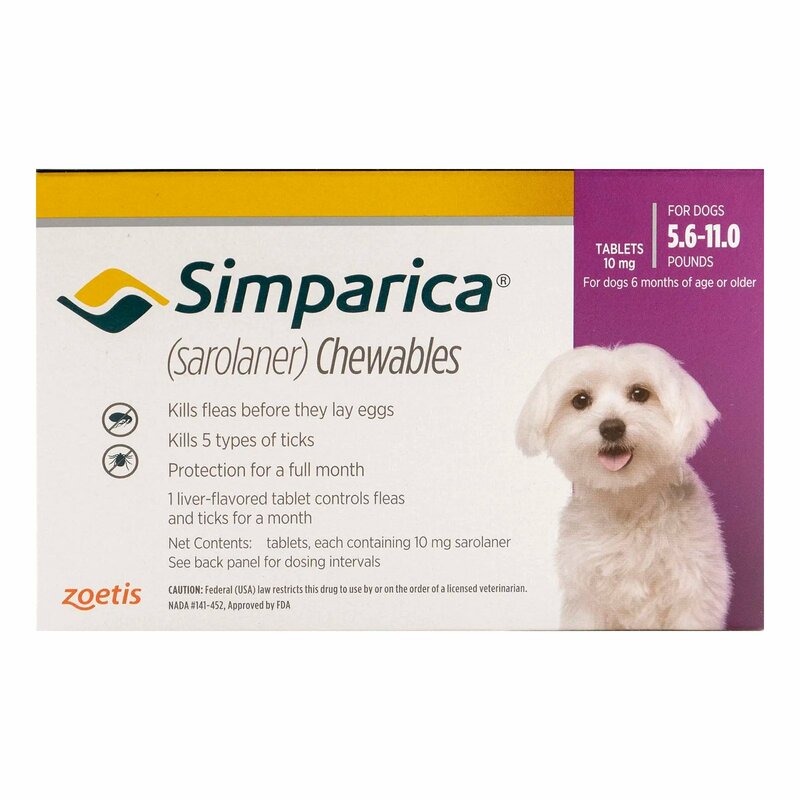 Dogs enjoy eating this chewable making it very easy to administer. 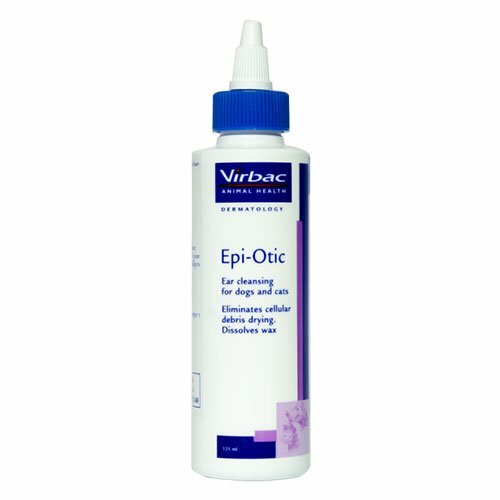 It provides persistent protection to dogs from fleas and ticks. It provides instant relief from prevailing flea infestations even on dogs with flea allergies. It kills fleas before they have any chance of laying eggs, thus preventing flea infestation. It also kills ticks quickly, thus protecting the dogs from dangerous flea and tick borne diseases. 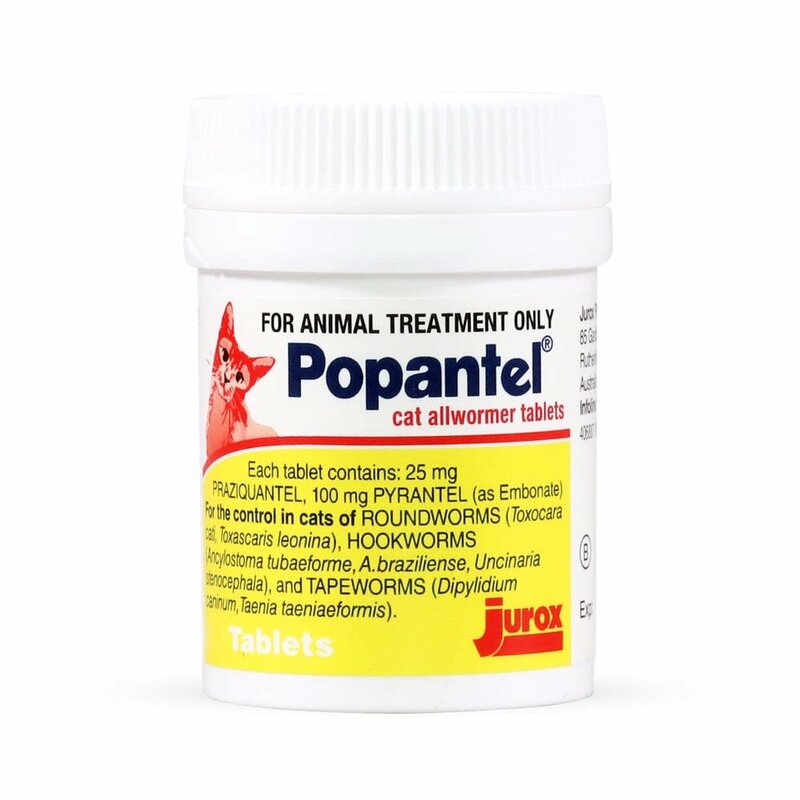 Sarolaner is the active ingredient present in this flea and tick preventive treatment. It disrupts the neuromuscular activity of the parasites leading to their eventual death. It is suitable for all dog breeds and sizes. Simparica for Dogs is a swift working flea and tick preventive treatment that starts killing fleas and ticks within hours of administration. It is a monthly treatment that prevents re-infestations. It is effective against flea infestations and treats and controls tick infestations. 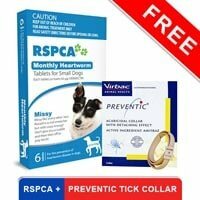 It starts killing adult fleas within 3 hours of administration and ticks within 8 hours of administration. You can commence this flea and tick preventive treatment at any time of the year. 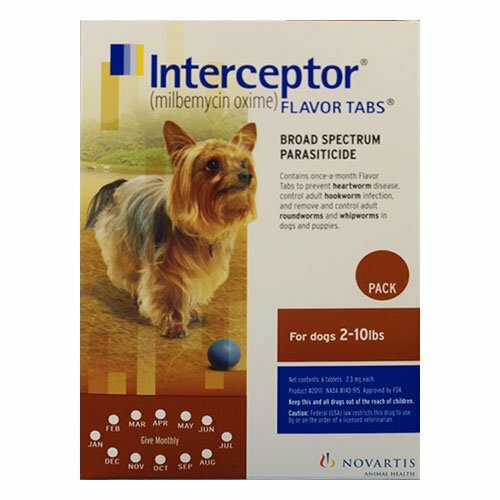 It is recommended for dogs more than 6 months of age and weighing more than 2.8 lbs. in bodyweight. 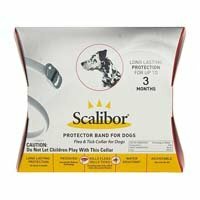 Recommended for dogs at least 6 months of age weighing more than 2.8 lbs. Give one chewable per month to the doggy. Administer it orally in the mouth of the dog or mix it in the dog food. If you mix it in the dog food, ensure that your furry pal chews the treatment rather than swallowing it without chewing for effective results. Ensure that the doggy completes his entire meal. If you feel that any dose has been lost then re-dose the furry pal as necessary. This treatment is recommended for dogs and puppies at least 6 months of age and weighing more than 2.8 lbs. The safety of the treatment on pregnant, lactating or breeding dogs has not been evaluated. Never allow children and other pets to get near the product. After giving this oral treatment to the dog, wash your hands properly with soap and water. This treatment is only for dogs and no other animal species. 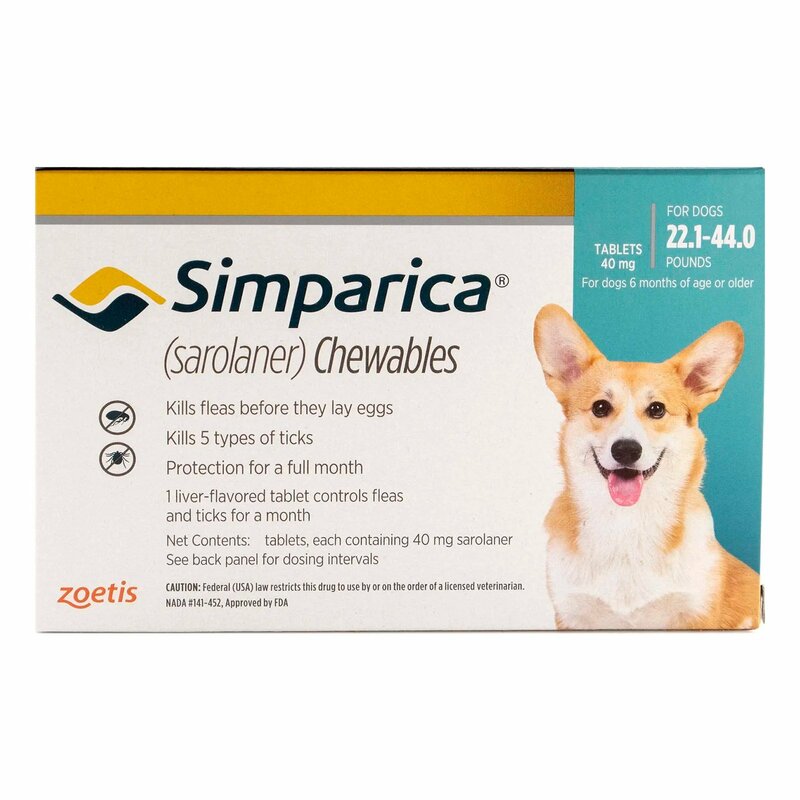 Talk to your vet before administering Simparica chewable to your dog having the history of seizures, muscle tremor and ataxia. 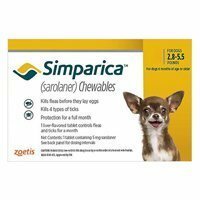 Simparica chews are tasty and my dog loves the flavor. I just put it in her bowl and he eats it immediately. Like he is being given a treat. 39 of 883 found this review helpful. 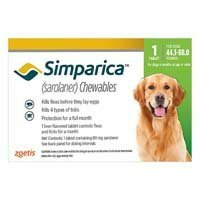 I choose Simparica chews as I've heard a lot about it. And, yes definitely it was fast and effective, gave results quickly!! 1 of 107 found this review helpful. I take my dogs for walks and to the dog park often. They stay flea free. 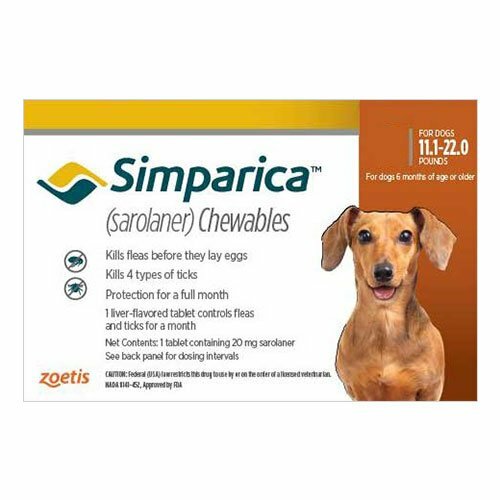 Simparica is my favorite flea prevention product. 74 of 76 found this review helpful. I've used all the flea and tick control products on the market and Simparica works the best and is the fastest. I'm concerned about Jeff's review though. He said he's been using Simparica for for years, which is impossible since it's only been approved for use since 2016. 38 of 46 found this review helpful. I have a Bassett Hound and a Corgi. I had tried Advantage II and Soresto collar but still had a major infestation. Within 24 hours of Simparica, I combed dead fleas from my dogs---AWESOME !! 55 of 132 found this review helpful. Best of all with amazing price deals.. I love to order for Jimmy and Nancy from budgetpetcare.com as they provide excellent deals with free shipping as well. I trust the products for it has been a long time ordering.. Thanks!! Swift flea and tick destroyer. Upon chewing the oral treatment, within a day all pests run away.. I give it as a treat once a month..
42 of 43 found this review helpful.